Having enjoyed several shows from Grid Iron in recent years, I'd always been curious about their "Decky Does A Bronco" that featured in many actors' programme notes. So I was delighted to see that they had revived Douglas Maxwell's play ten years after their first production of it. Staged in purpose built swing parks and told in flashback it tells the story of a group of children and the summer their lives changed. Any play that portrays young children with an adult cast is on potentially difficult ground and here the risks are amplified by having other (and only slightly older) actors portray the adult versions of the characters. Fortunately the 'young' cast perform brilliantly and bring out the childish elements without forcing them into caricature. The 'older' cast have considerably less stage time, but their quiet and subdued presence speaks volumes in itself and the considered direction from Ben Harrison ensures there is little chance of confusion. Bridging the two 'casts' is Martin McCormick, who as David acts as our narrator and slips between his older and younger selves with a very assured performance in what must be a very tricky role. 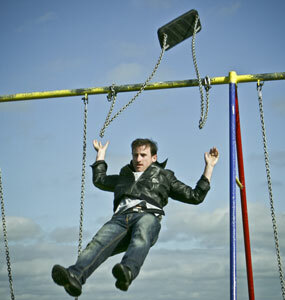 And if the roles weren't challenging enough, Maxwell and Harrison task their cast with some impressive acrobatic manoeuvres on the swings - including the 'Bronco' of the title which involves standing on the swing and working it up to a height before jumping off while 'kicking' the swing over the top bar. This is not without risk to the performers (and I speak as a former ten year old with a head gash to prove it) but their swing play was executed perfectly - to the point of being balletic. Despite the excellent performances, the play itself has left me a little unsatisfied and wishing it had focused more on the aftermath and long term impact of the events rather than over-relying on a sucker punch. With the wind gusting and the physicality of the performances causing occasional sound drop-outs I was left at times grasping to hear lines and found myself joining dots of plot points that perhaps weren't intended to be joined - but the fact I was looking to join them suggests to me that there was something missing. Indeed, for me the most profound aspects of the evening came not from the play but from Ben Harrison's programme notes. But perhaps I'm guilty of expecting too much and should just appreciate what is undeniably a perfectly captured picture of childhood that will have particular cultural resonances for those of a certain age. Decky Does A Bronco has completed its run at Cumbernauld and continues on an extensive tour of Scotland before taking up residency as part of the Edinburgh Fringe and then completing its run with various dates in England. Image by Douglas Jones used with permission. I cannot wait to see it! Missed it first time around. I'm very interested in your review. I wonder if the site-specificness interest triumphs over the production? Though I do like the script. Looking forward to it!